The medical crate is a crate found only at radiation towns. The crate spawns with items for the player to pick up. 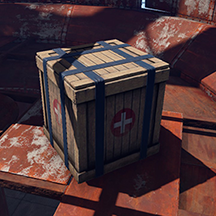 Like the other types of crates, it can not be destroyed by players and will only disappear when all of its contents are emptied.